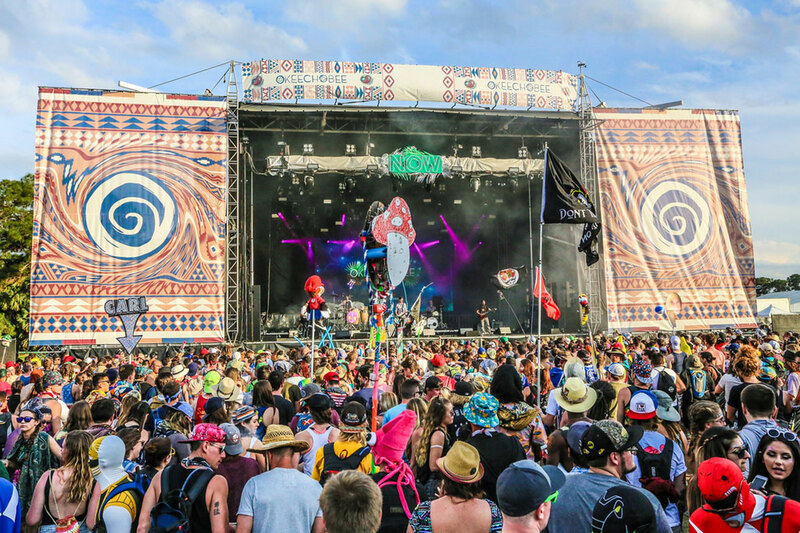 This year, Okeechobee Music Fest is truly a global event. Attendees will be traveling from every continent except Antarctica, 60 countries, every US State, and over 2,370 cities from around the globe. The Okeechobee Music & Arts Festival, a diverse, multi-genre event kicked off this weekend from Thursday, March 2– Sunday, March 5, and has officially sold out of all available tickets for the second year in a row. The second annual edition of North America’s most exciting new festival will take place at Okeechobee, Florida’s beautiful Sunshine Grove, located on over 600 acres of pristine grasslands, lakes, and exotic tropical woodlands. This weekend’s celebration will mark the start of spring with world-renowned and on-the-rise performers, art installations to inspire with awe, yoga and meditation to cleanse the soul, great food, and friends new and old to enjoy it all with. Artists performing at the 2017 festival includeKings of Leon, Usher & The Roots, Bassnectar, Sturgill Simpson, The Lumineers, Flume, Wiz Khalifa, Pretty Lights, Solange, Logic, Rae Sremmurd, Young The Giant, Porter Robinson (Live), Anderson .Paak & The Free Nationals, and many more. For additional details on the artists performing, along with information on Okeechobee’s exciting nightly dusk-till-dawn electronic experience,Jungle 51, visit OkeechobeeFest.com. Okeechobee 2017 will also feature the return and expansion of ChobeeWobee Village, (schedule), the cultural nexus of the festival that will provide a place to mingle, wander, explore, stretch, and relax amongst a myriad of carefully crafted (and curated) curiosities. Co-Curated by Kulturehaus, ChobeeWobee Village is home to Yogachobee,The Earth Arts Academy and the Healing Sanctuary (schedule). All three have their own mind-expanding programming which is sure to stretch the body, and soul while polishing up one’s survival skills. If you are not attending the The Okeechobee Music & Arts Festival this year, keep up to date following on facebook.com/okeechobeefest, twitter.com/okeechobeefest, and instagram.com/okeechobeefest. For the second year in a row, the Okeechobee Music & Arts Festival Sold Out. According to statistics, this year Okeechobee Fest is truly a global event.